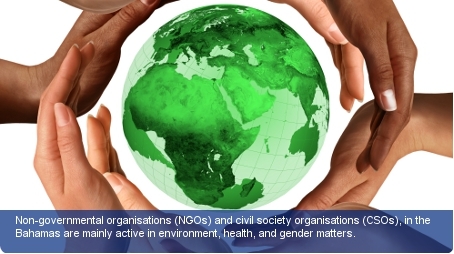 Non-governmental organisations (NGOs) and civil society organisations (CSOs), in the Bahamas are mainly active in environment, health, and gender matters. These NGOs work hard to enhance the country’s infrastructure and well-being. They are one of the wealthiest countries in the Western Hemisphere, with strong links to the United States, who aided The Bahamas financially in 2005 due to damage caused by Hurricane Wilma. The Bahamas National Trust (BNT) is the leading environmental NGO. BNT is mandated with the development and management of the country’s National Park System. BNT and the Bahamas Reef Environment Education Foundation (BREEF) work closely with the Ministry of Education and Training to find ways to educate adults and schools pupils on environmental issues. There are a number of NGOs involved in assisting the Government of the Bahamas in providing family planning advice with the aim of stemming the spread HIV/AIDS through awareness programmes and the provision of test centres. The operation of NGOs is governed by the Non-Governmental Organisations Act 2005, which came into effect on 1, January 2007. The law stipulates that NGOs cannot operate in the country without registering with the Director of Legal Affairs or the appointed Registrar of Non-Governmental Organisations. Each economic sector in The Bahamas has its own respective trade union and is an active part of the country’s civil society. Disagreements between trade unions are publically known in The Bahamas. There are two main trade union centres in the country.